The Self-Absorbing Man: Daredevil Day! Daredevil #1, Page 1, Panel 2 detail. 2011. Ink on Marvel board, 11 × 17.25″. Today is the day, folks! If you like blind lawyers who dress up in red tights and horns and jump around rooftops by night, then this is the book for you. Seriously. If that's the sort of thing you like, then we're pretty much the only people who are selling right now. This has been a labor of love for all involved, and it's the reason I haven't been blogging as of late. I'm working with some of my absolute favorite creators, at least one of whom gave me a Y chromosome (the panels featured above and below were inked by my Dad). Furthermore, I've just entered my 10th year of working for Marvel, but this is my first attempt at an ongoing title. This book means a lot to me. I hope it will mean just as much to you, and hopefully we can ride this wave together for some time. By the way, I don't surf. 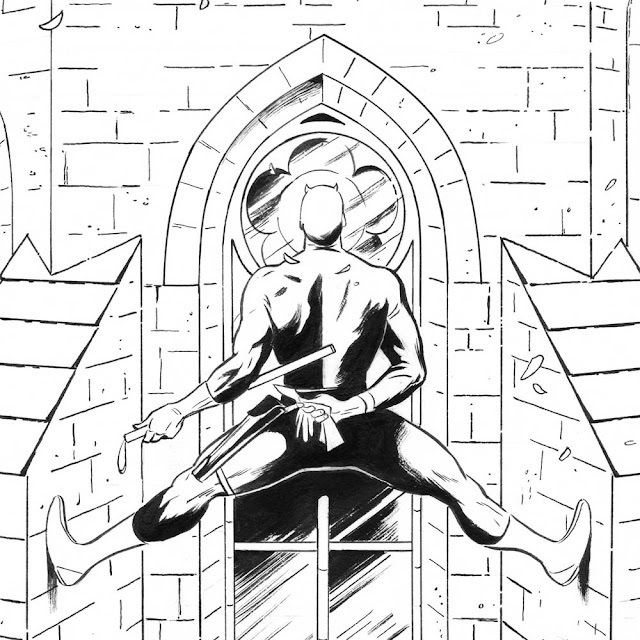 Daredevil #1, Page 18, Panel 2. 2011. Ink on Marvel board, 11 × 17.25″. And speaking of working for Marvel, the job certainly has its perks, as I will be attending an advanced screening of Captain America today. I can only hope that Chris Evans says my name during the movie, but stays away from my girlfriend. And speaking of my girlfriend, she said that this is the part of the blog post where I go on and on thanking everyone who helped me through the birthing process. I'll save the speech for now, as I am still in the midst of labor. Peace! It'll be a couple more days until I get to pick up my copy of your premiere on DD. Until I get to actually hold it in my hands, I want to say the previews have been exceptional, and they made the anticipation even sweeter. Congratulations to the entire team! Congratulations on this milestone and best of luck to all of you going forward! I don't think I've ever been this excited for new comic book day, and it's so exciting to see all the lucky bastards at Marvel (who got to read this before it hit the store) praise it the way they have. Have fun at the Captain America screening! ps. hello to chris evans. Just read my copy: Waid did a wonderful job on the writing, but you brought the house down with some of the most stunning art I've seen on a Marvel book. You've also managed to make the Spot one of the creepiest-looking villains ever. My expectations of this was high. This can be good because i'm excited for it. But this can also be bad when it's finally here and the body of work doesn't meet the excitement. I'd have to say that after reading it twice already, this issue Delivered. The panels added so much life to the story with the solid lines and flowing structure that it carried me through the pages with childlike zeal. This along with the superb writing made for a great read. I will be eagerly looking forward to the issues to follow. Congrats on your masterful work on this. Thanks so much, everybody! We're hard at work on issue 3 now, and Martin is already working on 4, so hopefully we'll be able to command a solid (and timely) run.